Your hair, skin and nails need nutrition just as much as your muscles and all the rest of your body. Nature's Way Hair and Skin with MSM and Glucosamine is specially blended to specifically support these often overlooked parts of your body. The main ingredients are MSM and Glucosamine which help your body produce the compounds, like collagen, that maintain hair, skin, and nails naturally. MSM provides sulfur, which your body needs to make keratin and collagen, which together are responsible for your skin's strength and elasticity. Low sulfur levels lead to brittle nails and hair, as well as acne and other skin problems. In addition to these major ingredients, Nature's Way Hair and Skin also uses natural herbs and other nutrients to support hair and skin health. Traditional treatments for hair and skin problems like Fo-Ti and Nettle are blended with nutrients like Biotin which is medically prescribed for hair loss, to keep your hair and skin looking great. 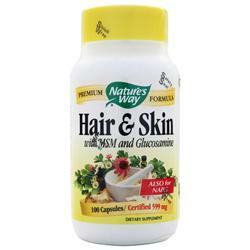 Feed your hair, skin and nails with Nature’s Way Hair and Skin with MSM and Glucosamine. Hair & Skin formula is a specially balanced blend of herbs, enzymes and other nutrients to support healthy hair, skin and nails. Consult a healthcare practitioner before using this product if you are pregnant or have hyperthyroidism or cardiac or kidney disfunction. Contains shellfish.